David Dobbs’ story, which explained how social life can affect gene expression, won a AAAS Kavli Science Journalism Award in 2014. Dobbs writes features and essays about science, sports, music and other cultures for publications including National Geographic, The Atlantic, Pacific Standard, Slate, and Mother Jones. Your DNA is not a blueprint. Day by day, week by week, your genes are in a conversation with your surroundings. Your neighbors, your family, your feelings of loneliness: They don’t just get under your skin, they get into the control rooms of your cells. 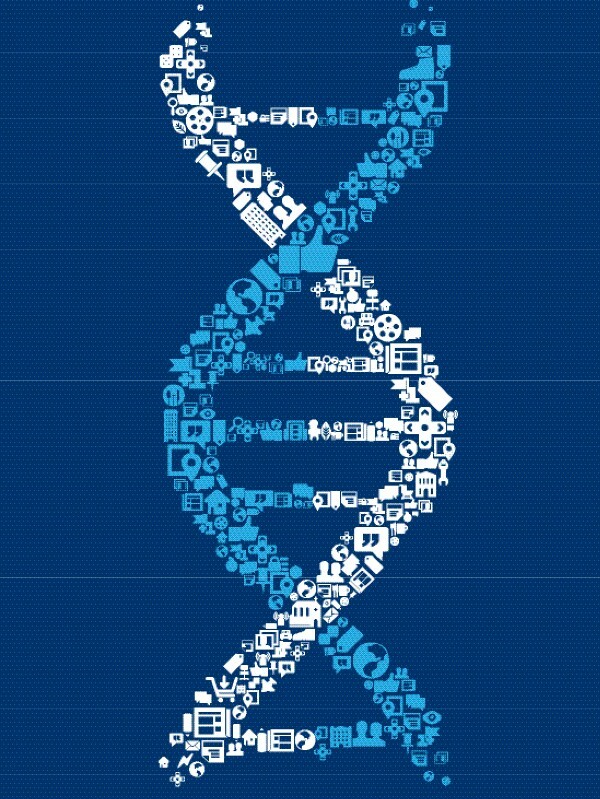 Inside the new social science of genetics. Illustration by Jeremy Dimmock (originally published in the Pacific Standard). Working carefully, Robinson’s conspirators — researchers at Mexico’s National Center for Research in Animal Physiology, in the high resort town of Ixtapan de la Sal — jiggled loose the lids from two African hives and two European hives, pulled free a few honeycomb racks, plucked off about 250 of the youngest bees from each hive, and painted marks on the bees’ tiny backs. Then they switched each set of newborns into the hive of the other subspecies. The AAAS Kavli awards recognize distinguished science reporting by professional journalists. This story won the Magazine award in 2014. He suspected the answer lay in the bees’ genes. He didn’t expect the bees’ actual DNA to change: Random mutations aside, genes generally don’t change during an organism’s lifetime. Rather, he suspected the bees’ genes would behave differently in their new homes — wildly differently. Sometimes these turns of the dimmer switch correspond to basic biological events, as when you develop tissues in the womb, enter puberty, or stop growing. At other times gene activity cranks up or spins down in response to changes in your environment. Thus certain genes switch on to fight infection or heal your wounds — or, running amok, give you cancer or burn your brain with fever. Changes in gene expression can make you thin, fat, or strikingly different from your supposedly identical twin. When it comes down to it, really, genes don’t make you who you are. Gene expression does. And gene expression varies depending on the life you live. Robinson, however, suspected that environment could spin the dials on “big sectors of genes, right across the genome” — and that an individual’s social environment might exert a particularly powerful effect. Who you hung out with and how they behaved, in short, could dramatically affect which of your genes spoke up and which stayed quiet — and thus change who you were. To a bee, the pheromone makes a social statement: Friends, you are in danger. Robinson had long known that bees react to this cry by undergoing behavioral and neural changes: Their brains fire up and they literally fly into action. He also knew that repeated alarms make African bees more and more hostile. When Alaux looked at the gene-expression profiles of the bees exposed again and again to alarm pheromone, he and Robinson saw why: With repeated alarms, hundreds of genes — genes that previous studies had associated with aggression — grew progressively busier. The rise in gene expression neatly matched the rise in the aggressiveness of the bees’ response to threats. Robinson had not expected that. “The pheromone just lit up the gene expression, and it kept leaving it higher.” The reason soon became apparent: Some of the genes affected were transcription factors — genes that regulate other genes. This created a cascading gene-expression response, with scores of genes responding. There, Robinson’s staff removed the bees’ sesame-seed-size brains, ground them up, and ran them through a DNA microarray machine. This identified which genes were busy in a bee’s brain at the moment it met the bee-vac. When Robinson sorted his data by group — European bees raised in African hives, for instance, or African bees raised normally among their African kin — he could see how each group’s genes reacted to their lives. These bees didn’t just act like different bees. They’d pretty much become different bees. To Robinson, this spoke of a genome far more fluid — far more socially fluid — than previously conceived. Robinson soon realized he was not alone in seeing this. At conferences and in the literature, he kept bumping into other researchers who saw gene networks responding fast and wide to social life. David Clayton, a neurobiologist also on the University of Illinois campus, found that if a male zebra finch heard another male zebra finch singing nearby, a particular gene in the bird’s forebrain would “re up — and it would do so differently depending on whether the other finch was strange and threatening, or familiar and safe. Gene Robinson, an entomologist at the University of Illinois, found that, when European honeybees are raised among more aggressive African killer bees, they not only start to become as belligerent as their new hive mates — they come to genetically resemble them. Photo courtesy of Gene Robinson (originally published in the Pacific Standard). Others found this same gene, dubbed ZENK ramping up in other species. In each case, the change in ZENK’s activity corresponded to some change in behavior: a bird might relax in response to a song, or become vigilant and tense. Duke researchers, for instance, found that when female zebra finches listened to male zebra finches’ songs, the females’ ZENK gene triggered massive gene-expression changes in their forebrains — a socially sensitive brain area in birds as well as humans. The changes differed depending on whether the song was a mating call or a territorial claim. And perhaps most remarkably, all of these changes happened incredibly fast — within a half hour, sometimes within just five minutes. This big something, this startlingly quick gene-expression response to the social world, is a phenomenon we are just beginning to understand. The recent explosion of interest in “epigenetics” — a term literally meaning “around the gene,” and referring to anything that changes a gene’s effect without changing the actual DNA sequence — has tended to focus on the long game of gene-environment interactions: how famine among expectant mothers in the Netherlands during World War II, for instance, affected gene expression and behavior in their children; or how mother rats, by licking and grooming their pups more or less assiduously, can alter the wrappings around their offspring’s DNA in ways that influence how anxious the pups will be for the rest of their lives. The idea that experience can echo in our genes across generations is certainly a powerful one. But to focus only on these narrow, long-reaching effects is to miss much of the action where epigenetic influence and gene activity is concerned. This fresh work by Robinson, Fernald, Clayton, and others — encompassing studies of multiple organisms, from bees and birds to monkeys and humans — suggests something more exciting: that our social lives can change our gene expression with a rapidity, breadth, and depth previously overlooked. Why would we have evolved this way? The most probable answer is that an organism that responds quickly to fast-changing social environments will more likely survive them. That organism won’t have to wait around, as it were, for better genes to evolve on the species level. Immunologists discovered something similar 25 years ago: Adapting to new pathogens the old-fashioned way — waiting for natural selection to favor genes that create resistance to specific pathogens — would happen too slowly to counter the rapidly changing pathogen environment. Instead, the immune system uses networks of genes that can respond quickly and flexibly to new threats. We appear to respond in the same way to our social environment. Faced with an unpredictable, complex, ever-changing population to whom we must respond successfully, our genes behave accordingly — as if a fast, fluid response is a matter of life or death. When Cole started his social psychology research in the early 1990s, the microarray technology that spots changes in gene expression was still in its expensive infancy, and saw use primarily in immunology and cancer. So he began by using the tools of epidemiology — essentially the study of how people live their lives. Some of his early papers looked at how social experience affected men with HIV. In a 1996 study of 80 gay men, all of whom had been HIV-positive but healthy nine years earlier, Cole and his colleagues found that closeted men succumbed to the virus much more readily. Something about feeling stressed or alone was gumming up the immune system — sometimes fatally. His next step was to turn to rhesus monkeys, a lab species that allows controlled study. In 2007, he joined John Capitanio, a primatologist at the University of California-Davis, in looking at how social stress affected rhesus monkeys with SIV, or simian immunodeficiency virus, the monkey version of HIV. Capitanio had found that monkeys with SIV fell ill and died faster if they were stressed out by constantly being moved into new groups among strangers — a simian parallel to Cole’s 1996 study on lonely gay men. Capitanio had run a rough immune analysis that showed the stressed monkeys mounted weak antiviral responses. Cole offered to look deeper. First he tore apart the lymph nodes — “ground central for infection” — and found that in the socially stressed monkeys, the virus bloomed around the sympathetic nerve trunks, which carry stress signals into the lymph node. Finally Cole got his chance. At UCLA, where he had been made a professor in 2001, he had been working hard to master gene-expression analysis across an entire genome. Microarray machines — the kind Gene Robinson was using on his bees — were getting cheaper. Cole got access to one and put it to work. He found a broad, weird, strongly patterned gene-expression response that would become mighty familiar over the next few years. Of roughly 22,000 genes in the human genome, the lonely and not-lonely groups showed sharply different gene-expression responses in 209. That meant that about one percent of the genome — a considerable portion — was responding differently depending on whether a person felt alone or connected. Printouts of the subjects’ gene-expression patterns looked much like Robinson’s red-and-green readouts of the changes in his cross-fostered bees: Whole sectors of genes looked markedly different in the lonely and the socially secure. And many of these genes played roles in inflammatory immune responses. Normally, a healthy immune system works by deploying what amounts to a leashed attack dog. It detects a pathogen, then sends inflammatory and other responses to destroy the invader while also activating an anti-inflammatory response — the leash — to keep the inflammation in check. The lonely Chicagoans’ immune systems, however, suggested an attack dog off leash — even though they weren’t sick. Some 78 genes that normally work together to drive inflammation were busier than usual, as if these healthy people were fighting infection. Meanwhile, 131 genes that usually cooperate to control inflammation were underactive. The underactive genes also included key antiviral genes. In early 2009, Cole sat down to make sense of all this in a review paper that he would publish later that year in Current Directions in Psychological Science. Two years later we sat in his spare, rather small office at UCLA and discussed what he’d found. Cole, trimly built but close to six feet tall, speaks in a reedy voice that is slightly higher than his frame might lead you to expect. Sometimes, when he’s grabbing for a new thought or trying to emphasize a point, it jumps a register. He is often asked to give talks about his work, and it’s easy to see why: Relaxed but animated, he speaks in such an organized manner that you can almost see the paragraphs form in the air between you. He spends much of his time on the road. Thus the half-unpacked office, he said, gesturing around him. His lab, down the hall, “is essentially one really good lab manager” — Jesusa M. Arevalo, whom he frequently lists on his papers — “and a bunch of robots,” the machines that run the assays. This helps explain, for instance, why many people who work in high-stress but rewarding jobs don’t seem to suffer ill effects, while others, particularly those isolated and in poverty, wind up accruing lists of stress-related diagnoses — obesity, Type 2 diabetes, hypertension, atherosclerosis, heart failure, stroke. 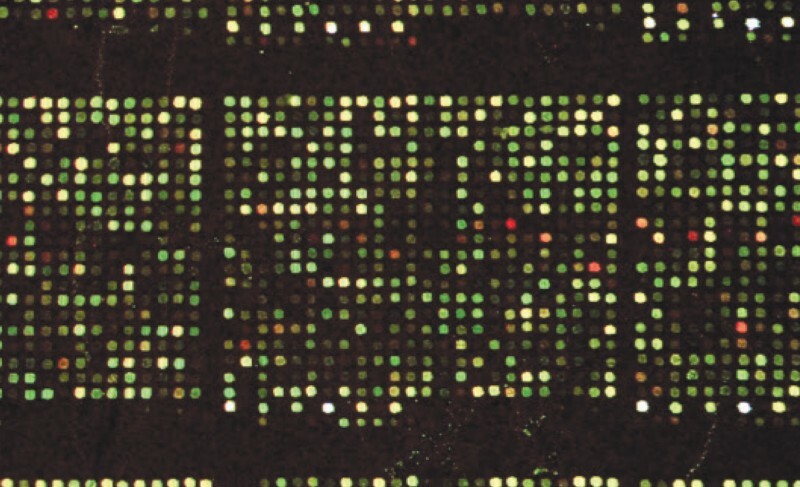 Gene-expression microarray printouts (this one comes from a study of autistic versus non-autistic people) depict snapshots of activity across a genome. Red squares represent genes that are more active, green squares represent genes that are less active (originally published in the Pacific Standard). Cole’s work carries all kinds of implications — some weighty and practical, some heady and philosophical. It may, for instance, help explain the health problems that so often haunt the poor. Poverty savages the body. Hundreds of studies over the past few decades have tied low income to higher rates of asthma, flu, heart attacks, cancer, and everything in between. Poverty itself starts to look like a disease. Yet an empty wallet can’t make you sick. And we all know people who escape poverty’s dangers. So what is it about a life of poverty that makes us ill? Cole asked essentially this question in a 2008 study he conducted with Miller and Edith Chen, another social psychologist then at the University of British Columbia. The paper appeared in an odd forum: Thorax, a journal about medical problems in the chest. The researchers gathered and ran gene-expression profiles on 31 kids, ranging from nine to 18 years old, who had asthma; 16 were poor, 15 well-off. As Cole expected, the group of well-off kids showed a healthy immune response, with elevated activity among genes that control pulmonary inflammation. The poorer kids showed busier inflammatory genes, sluggishness in the gene networks that control inflammation, and — in their health histories — more asthma attacks and other health problems. Poverty seemed to be mucking up their immune systems. Cole, Chen, and Miller, however, suspected something else was at work — something that often came with poverty but was not the same thing. So along with drawing the kids’ blood and gathering their socioeconomic information, they showed them films of ambiguous or awkward social situations, then asked them how threatening they found them. The Kaufman study at first looks like a classic investigation into the so-called depression risk gene — the serotonin transporter gene, or SERT — which comes in both long and short forms. Any single gene’s impact on mood or behavior is limited, of course, and these single-gene, or “candidate gene,” studies must be viewed with that in mind. Yet many studies have found that SERT’s short form seems to render many people (and rhesus monkeys) more sensitive to environment; according to those studies, people who carry the short SERT are more likely to become depressed or anxious if faced with stress or trauma. Or, to phrase it as Cole might, the lack of a reliable connection harmed the kids almost as much as abuse did. Their isolation wielded enough power to raise the question of what’s really most toxic in such situations. Most of the psychiatric literature essentially views bad experiences — extreme stress, abuse, violence — as toxins, and “risk genes” as quasi-immunological weaknesses that let the toxins poison us. And abuse is clearly toxic. Yet if social connection can almost completely protect us against the well-known effects of severe abuse, isn’t the isolation almost as toxic as the beatings and neglect? Toward the end of the dinner I shared with Cole, after the waiter took away the empty platters and we sat talking over green tea, I asked him if there was anything I should have asked but had not. He’d been talking most of three hours. Some people run dry. Cole does not. He spoke about how we are permeable fluid beings instead of stable unitary isolates; about recursive reconstruction of the self; about an engagement with the world that constantly creates a new you, only you don’t know it, because you’re not the person you would have been otherwise — you’re a one-person experiment that has lost its control. “You can’t change your genes. But if we’re even half right about all this, you can change the way your genes behave — which is almost the same thing. By adjusting your environment you can adjust your gene activity. That’s what we’re doing as we move through life. We’re constantly trying to hunt down that sweet spot between too much challenge and too little. You may view the story in its original format at the Pacific Standard.